We have heard that after 1 month of age babies shouldn't be swaddled b/c it can impair their motor development. We usually swaddle him at nighttime and naps. Is this too much? 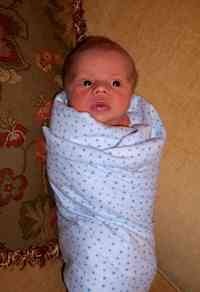 Swaddle and love your baby. We swaddle our babies for sleep until they no longer find it comforting. We fully swaddle them (both arms and legs) until 2 to 3 months old. After this we typically swaddle just their legs for a few months. The argument that swaddling impairs development is similar to saying that holding your baby slows their walking. Your child should have periods of time where they are allowed to freely exercise and comforting time where they are just loved. Swaddling your son at bedtime will not interfere with his development.